If you are inspired by the smell of freshly laser cut wood parts or draw enjoyment from seeing ideas take flight from little more then plan, stick and sawdust or perhaps you have cut your teeth on ready to fly models and want to explore what is arguably the most rewarding aspect within the discipline of aeromodeling. Whatever your background and whatever skills you bring to your building board rest assured we understand you, like you, we are builders. Therefore let me be the first to welcome all seasoned builders and intrepid new comers alike, to the first of what I hope will be many enjoyable publications from the staff at BalsaBuilder. It is our sincere desire to preserve within these pages the ideas that have both entertained and inspired generations who identify themselves as builders and to act upon the creative spark that turns dreams into flying machines. 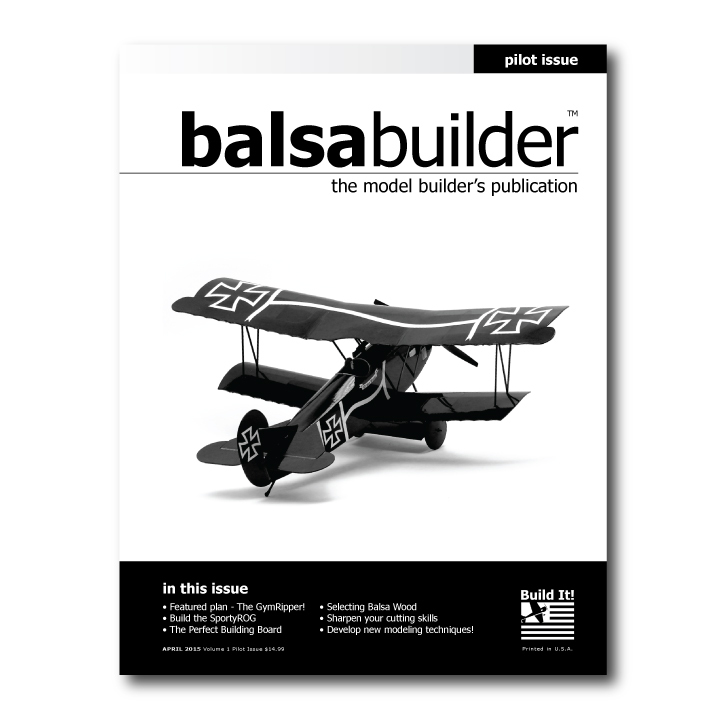 The BalsaBuilder quarterly is authored by a seasoned group of aeromodeling enthusiasts most of whom come from a commercial background of design and production within the aeromodeling industry. However, BalsaBuilder is much more encompassing in scope as inspiration, content, and ideas are presented, and welcomed, from the body of the aeromodeling community as a whole. Some of you are fellow hobbyists, business owners, teachers, some are aerospace engineers, some are mentoring children who may have never touched a #11 hobby knife. Broadly, BalsaBuilder is you. It is your love of aeromodeling that drives our desire to share in this experience with you. Effectively BalsaBuilder is a publication for builder written by builders. Our content delivery and teaching style is centered around a collection of instructive technical articles designed to share ideas, skills, and advice. As visuals play a large roll in learning you’ll find the pages of BalsaBuilder stuffed with clear illustrations and photography to aid in internalizing what can be big concepts, especially to newcomers. Each publication is then crafted around a series of projects. A selection of three plans built projects are carefully presented within each issue to allow the hands-on-process to reinforce the technical content and teach the art of building. Those pressed for time to pursue their aeromodeling passion will appreciate the availability of thoughtful short kit (pre-cut parts packs) support for the projects presented herein. Conspicuously absent from our publication are the litany of solicitations that span the choice publication space. Our editor finds that burying the informative content within a web of such distractions, to be counter productive to the teaching process. We hope you find our laser like focus on presentation of content to be a refreshing change of pace from the traditional “feel” of the bookseller variety magazine. Over the last several decades the old guard “builder” magazines faced increasing pressure (albeit not from their readership) to provide “content” within their fold devoted to the throng of consumer grade radio control products. The process resulted in many publications delivering little more than paid advertising to their subscribers. While it can be argued that the increased availability of these consumer products has helped expand the base of those who fly for sport; has the marked reduction of published build projects, plans, articles, and technical features helped retain the interest of the aeromodeling hobbyists among us? I think the long list of now defunct publications speaks clearly to this. It is with sincere pleasure that we thank you in advance for partnering with BalsaBuilder in this journey to share our passion, resources, and love of aeromodeling with this and generations to come.